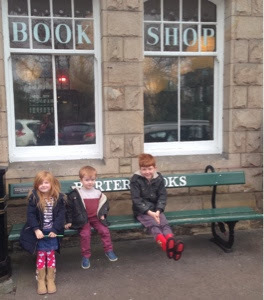 Barter books in Alnwick is one of the UK's largest second hand bookstores and really is somewhere special. 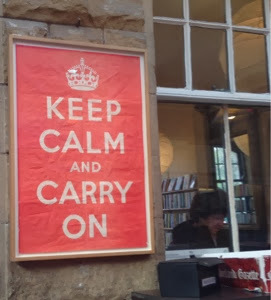 It is also where you can find one of the original 'keep calm and carry on' posters on display. 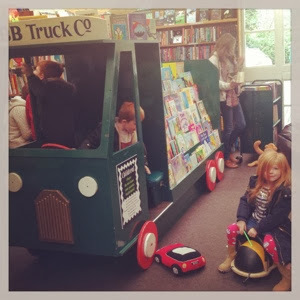 Barter books is just a wonderful place to visit with the family and I can't wait to tell you about it. 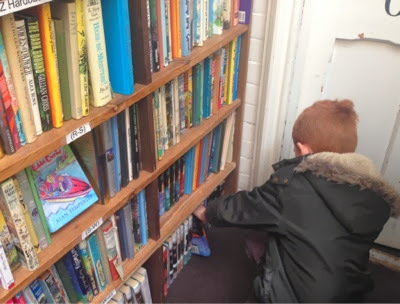 One of the features of Barter Books is that you can take your own books along and trade them for barter credit which can then be spent in store. There are restrictions which you can read more about here - incoming books. You don't need to barter your own books and can simply purchase or browse books as you please. Books are second hand so are cheaper than new, however they are slightly more expensive than a charity shop. 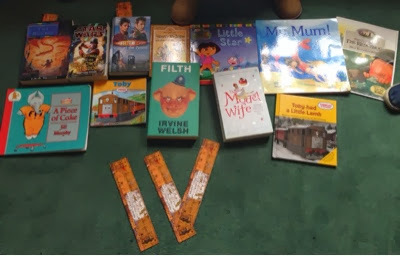 As a guide, we bought these 12 books for just over £20 (bookmarks were thrown in for free). 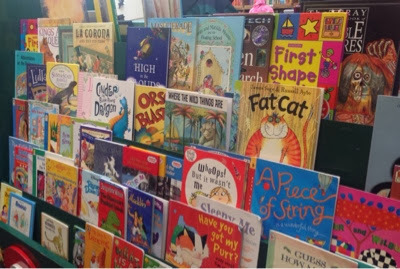 The first section we visited was the fantastic children's section. The variety of books here is better than our local library. There are toys too which keep the children entertained while you browse (don't leave them unsupervised though). 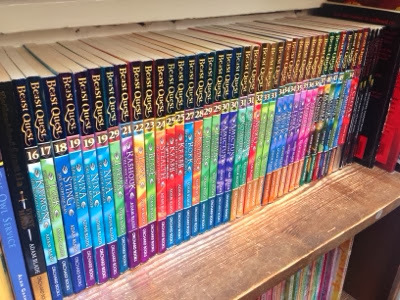 Look at all these Beast Quest books! 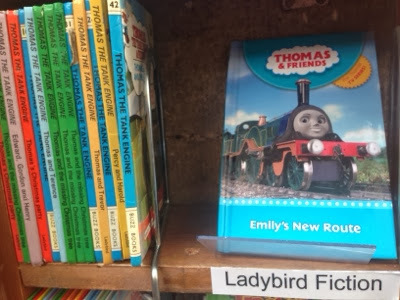 Lots of Thomas books for sale which pleased my toddler. 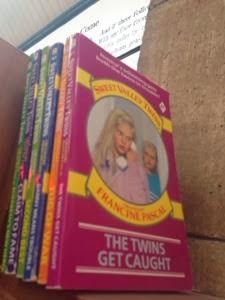 I even spotted a shelf dedicated to Sweet Valley high books! 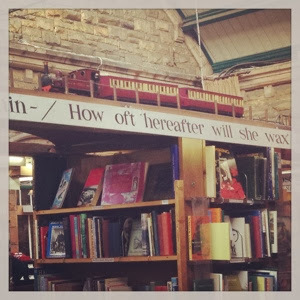 One of the main attractions of Barter books is the miniature toy railway that runs above your head in the shop. My children love watching out for the trains. 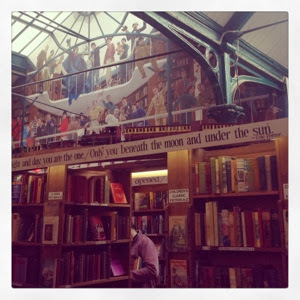 I could spend hours in Barter books, there is literally so much to explore! Including rare and vintage books. I love how there are lots of seats and areas you can relax with a book throughout the store. 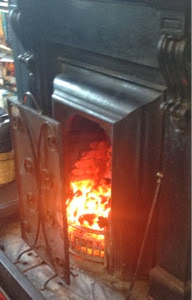 There is a lovely Station buffet cafe within Barter books which features roaring fires, unique seating and homemade treats. We did try and find a seat during our visit but it was just too busy :-( We have been before though and I can highly recommend the cakes if you can find a table which are set out like a station. 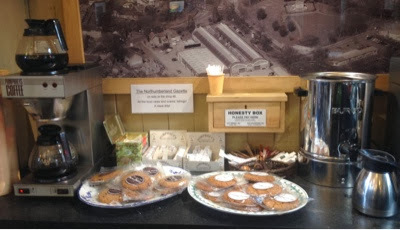 As an alternative to the cafe, there are tea and coffee making facilities and biscuits near the entrance and next to the lovely main fire and seating area. This is self serve and there is an honesty box which is just fantastic and really sums up the atmosphere of Barter books. 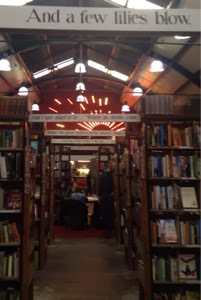 If you are looking for somewhere different to visit, try Barter books. My Nanna lived in Alnwick (gorgeous place) so this brought back a lot of memories for me as my Mum used to browse this place for hours! I remember it being quite cold inside (is it still?!) but an absolute treasure trove for book worms and im happy to see there is a café there now, or maybe there always was and I was too young to notice, or my Mum cleverly directed us away from it (im one of six!) Thanks for posting this. Barter Books is great. They often have some amazing classic cook books. We have a stupid amount of credit at Barter Books but we never get a chance to visit. Andrew lived in Blyth when we met so we often used to go but now we've moved and have a family it just never happens. This book shop looks fantastic, I haven't been to Alnwick in so long (and generally it's just to visit the castle) but I definitely need to g here! I've heard so many things about this place at still haven't visited!